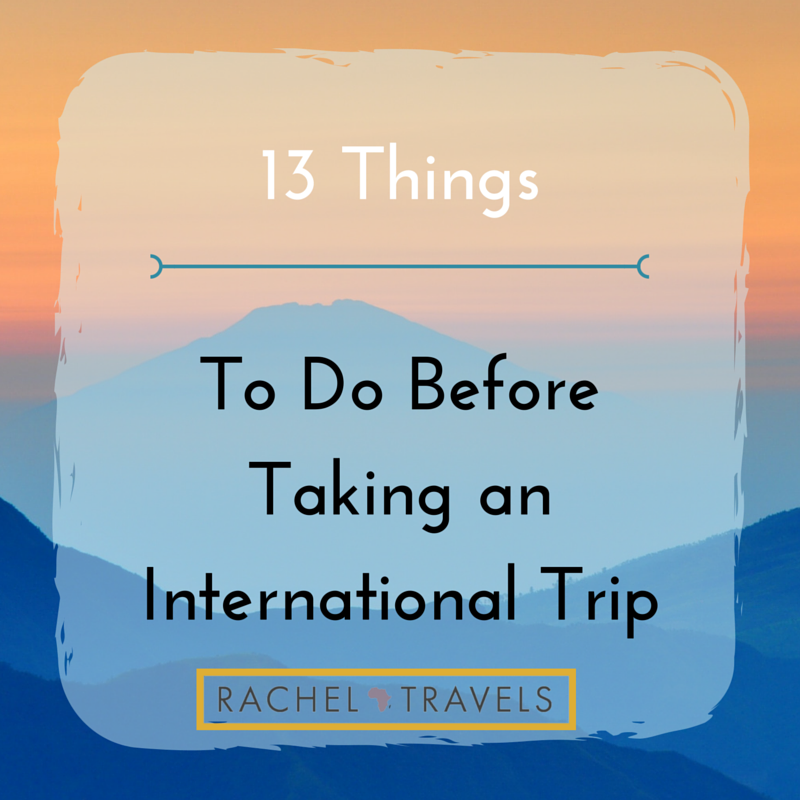 There is a lot that goes into preparing for an international flight! Sometimes I get overwhelmed with things that I must have in place before taking off! For starters, please make sure you have your passport in hand. Like, physically can see, touch, and smell it! Do not wait until the morning of to look for your passport and realize it may be misplaced. Make sure to check the dates as well. Many countries will not allow you to enter if you have less than six months before you passport expires! This should be done well in advance, but make sure that you know if you need a Visa or not. If you do, make sure you know the process. Some country visas require full applications, payments, and a visa to the Consulate while others can either be purchased online or paid for at the airport. In any case, check out this site to see if you need one or not. You want to be abreast of the social, economic, and political climate of the country you are headed to visit. Do not just limit yourself to American (or your local) news outlets or the US State Department travel warnings, look at the Canadian travel warnings and United Kingdom’s travel warnings. Make an assessment from there. if you are a US Citizen. It’s a form to let the government know which countries you are in at the time. That way, they can send you travel warnings and updates. And if the rare case that there is some disaster or disruption, they will know you are in the country and a way to locate you in anything happens. Always, always, ALWAYS have copies of your passport, flight itinerary, hotel/hostel/AirBnB information, and any other important documents. Keep a few copies on your person, in your carryon, in your luggage, and a leave a copy with a family member or friend at home. Muy importante! Let your banks and credit card companies know when you are leaving and the dates. That way they will not flag your card if all of a sudden you start spending or with drawing money from a foreign country. When I went to Brazil, I notified my bank and the Representative told me to be extra careful because Brazil is notorious for credit fraud. Turns out, my card was compromised in Brazil but the bank immediately stopped all charges because they knew I had returned home! Make sure your bills are paid! Nothing worst that going on a lovely trip and coming back with a whopping late fee! One way to mitigate this is to automatically pay your bills or at least keep due dates in your calendar. As stated above, make sure your family and friends at home know all the places you and are going and where you are staying in case someone needs to get in contact with you. Some countries require that you have certain shots and vaccinations before entering. Make sure you know if that is required. If you take prescription medication, make sure you have the refilled and ready to go when you are ready to head out! Seriously, this is the worst feeling ever. Non- fully charged devices and no converter to charge! Make sure you are fully charged before you are headed out too. The word that keeps popping up in this post is RESEARCH! Some countries may not require a visa, but you make have to pay an entrance or exit fee. This is true for the small island of Curacao as an example. If your current insurance does not cover you overseas, consider purchasing some travel insurance. If you plan on doing super adventurous (read: potentially hazardous/dangerous) get some insurance, this would include activities like rock climbing, shark diving, jet skiing, etc.